Conventional wisdom holds that burnout is primarily a problem of the individual. That is, people burn out because of flaws in their character, behavior, or productivity. From this perspective, the individual is the problem and the solution lies in changing the person. Burnout is a multi-faceted syndrome. Using burnout as merely a synonym for exhaustion underrepresents the problem. Measurement procedures and consistency matter. Only when researchers use the same measure in the same way will the results be comparable. Cutoff scores and single-item measures have well-established shortcomings that inhibit the growth of knowledge on burnout. Point 1. Burnout is a syndrome of exhaustion, depersonalization, and diminishing accomplishment. Three MBI subscales capture these nuances, reflected by High Exhaustion, High Depersonalization/Cynicism, and Low Efficacy. Burnout is a state of being chronically tired, cynical, and discouraged. And on the opposite end of the spectrum, the Engaged profile corresponds to Low Exhaustion, Low Depersonalization/Cynicism, and High Efficacy scores. Thus, the individual with a Burnout profile may report a wide range of worklife issues, including work overload, autonomy, collegiality, justice, and value conflicts with the organization. This combination differs substantially from just beginning the workday feeling tired and it presents more serious challenges for action. Using a person-oriented approach and a latent profile analysis with samples comprising thousands of healthcare workers, we also found respondent clusters that reflect a single problematic scale score. We labelled these profiles: Overextended (High Exhaustion), Disengaged (High Depersonalization/Cynicism) and Ineffective (Low Efficacy). The individual with an Overextended profile is most acutely experiencing work overload (Exhaustion). 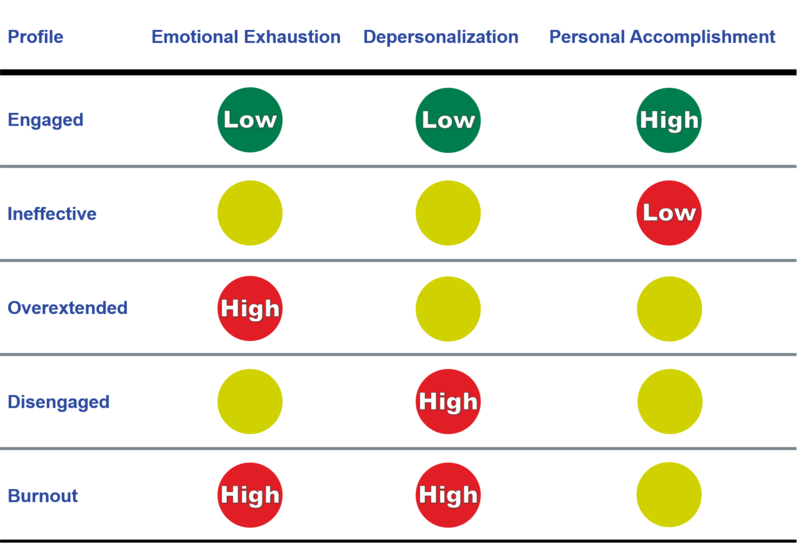 Conversely, the Disengaged individual is not overworked but has a disconnect with the organization, its members, culture, or values, as shown by a high Depersonalization/Cynicism score. By contrast, the Ineffective individual has a low Efficacy/Accomplishment score, without issues of exhaustion or cynicism. Rather than encountering stressors, the Ineffective profile lacks positive qualities of work (e. g., supportive relationships). The profiles can be useful when designing interventions. For example, an Overextended individual experiencing exhaustion may benefit from workload adjustments. By contrast, the Ineffective individual may need more recognition for their good work. But helping the Disengaged individual who has problematic relationships with coworkers and/or organizational values will require a different approach. The profile approach does not provide a single, crisp metric for distinguishing people as burned out rather than doing fine. Instead, it considers all three subscales to distinguish a burnout pattern from other problematic experiences of worklife. The Burnout profile is clearly more distressing than Overextended, but both have issues to address. Overall, the more negatively people experience their workplace, the more negatively they score on the MBI subscales. Improving employees’ experience of their workplace is simply a good idea. Point 2. Standardized (z) values are used to calculate profiles with the critical boundaries listed below. These critical boundaries will vary with context and are dependent on the population norms for the group. Therefore, an individual’s profile categorization may differ slightly based on the population used in the critical boundary calculation. Note: The yellow circles in the chart above mean that this scale is not relevant to the particular profile classification. The green "Low" circles correspond to scores below the high boundaries listed here. Point 3. Early work in burnout split the normative population into thirds and assigned arbitrary cut-off scores accordingly. This approach does not have diagnostic validity and its use is discouraged. Likewise, those who may wish to administer short-forms or one-item versions of the exhaustion and depersonalization measures are cautioned: these short forms are imprecise, they reduce the view to one dimension, and cannot encompass a complex construct. A single item on a 0-6 scale allows 7 scores, while 5 items on a 0-6 scale allows 35 scores, enabling an accurate and nuanced gauge of change over time or distinctions among groups. This degree of precision is required for understanding the multidimensional qualities of burnout and for assessing burnout interventions.